Three farm tractors in a freshly cut cornfield near Visalia, California. Agriculture producer confidence in the U.S. has fallen to its lowest level in four years, according to a survey released Monday. The confidence rating, which includes livestock and crop farmers, dropped from 106.9 in March to 99.8 in August, marking the first time the overall value has fallen below 100 since the survey began in 2010. Values of 100 are considered neutral, while those above 100 are considered optimistic, and those below 100 signal pessimism. Leading the decline are crop producers. Their confidence level dipped to 96.3 in August from the previous low of 102.7 set this past March. The lower number is due to falling crop prices, which have been in a free fall for months, said Katie Micik, DTN markets editor and director of the confidence index. "Prices are really an important factor in the psychology of farming," said Micik in a phone call with CNBC. "Corn future prices have fallen from about $8 a bushel in 2012 to the upper $3 range now." "It's not a crisis, but crop farmers are pretty stressed out," Micik explained. "Their profit margins are pretty tight." 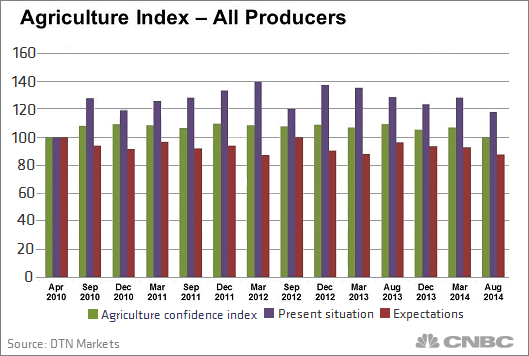 The confidence index, conducted three times a year, surveyed 500 producers across the U.S. It measures the sentiments of crop and livestock producers and their overall impressions of the agriculture sector. Both crop and livestock producers viewed their present conditions as declining with a total score of 118 in August—a drop from 128.1 in March and down from 128.8 in August 2013. Overall producers' future expectations fell to 87.8 from 92.8 in March and down from 96.2 last month. While crop producer confidence has fallen because of lower prices, those prices have helped keep livestock producer confidence at a somewhat stable level. Livestock producers' confidence was 108.7 this past August, nearly even with 108.9 from August 2013—but down from 116.4 in March 2014. "Because of the higher meat prices and lower feed costs, livestock producers in the Southwest and other parts of the country are pretty positive about their situation," said DTN's Micik. While livestock producers view their present situation as very positive (128.5) they were considerably less optimistic for the upcoming year (95.5). According to Micik, the survey also showed that 86 percent of all farmers polled expect their incomes to stay the same or get worse. The U.S. Department of Agriculture's recent farm income forecast projected a 14 percent decline year over year, the lowest estimate since 2010 but still the fifth highest on record. Micick added that it will take a while for crop farmers to see higher prices, because of lower import demands from China for corn and record storage in the U.S. of corn, wheat and soybeans. And Micik said that corn producers could suffer from proposals by the Environmental Protection Agency to reduce the amount of ethanol and other biofuels that are blended into gasoline. Ethanol is a fuel additive primarily made from corn that produces lower carbon emissions than gasoline. So far, the EPA said it's still in the process of finalizing the rules. All this is reflected in how crop farmers see their future, said Micik. Crop producers' expectations fell from 90.7 this past March to an all-time survey low of 84.8 in August 2014.